This lifelike couple look like they're unaware of each other's existence. 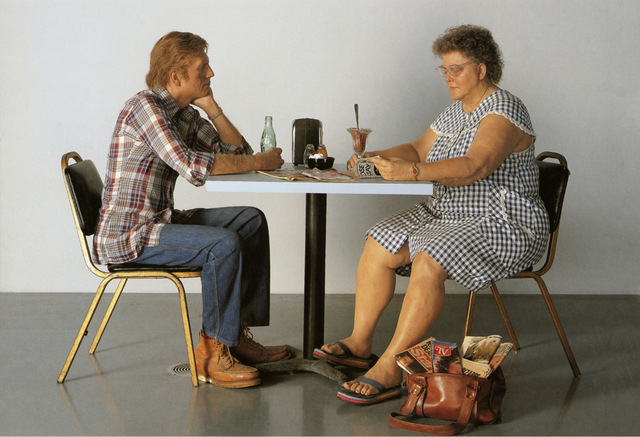 Courtesy of the estate of Duane Hanson and Gagosian. On entering the Serpentine Sackler gallery, visitors will be confronted with a garishly dressed woman selling half priced art and books. She looks like she's standing by a roadside, while nearby, a cowboy casually leans against a wall. These sculptures are scarily life-like, right down to the individual flecks of stubble and arm hairs. The detail is superb and only fellow artist Ron Mueck can compete in these stakes when it comes to making such lifelike models. There are a variety of depictions of everyday American life, including a cleaning lady with her trolley and men on a break at a construction site. But take a closer look and all does not seem right with these individuals; the couple dining together seem completely disinterested in each other and the obese man on the lawnmower ride looks lost in a daydream. The tinge of sadness in all these sculptures by Duane Hanson hints that things are not that well in the heartland of America, and that there are hidden stories behind each of these complex characters. None however are as shocking as the dead baby in the rubbish bin. Courtesy of Corvi-Mora, London and Jack Shainman Gallery, New York. 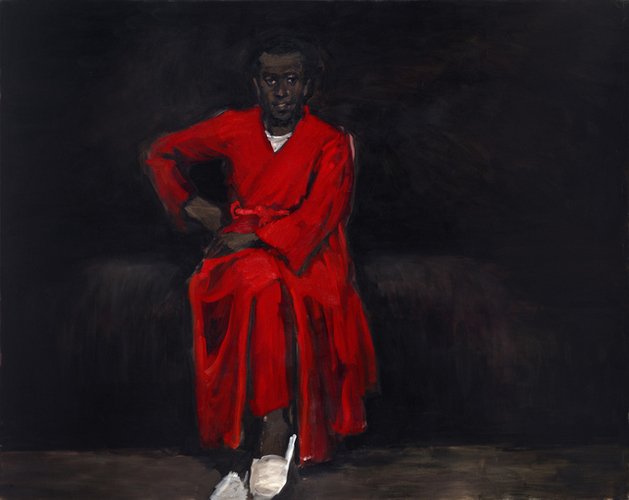 Lynette Yiadom-Boakye was nominated for the Turner Prize in 2013 for portraits clearly inspired by the likes of Goya and Rembrandt, but with the twist that all her paintings feature black people. We've seen her work in many exhibitions since, and though we've liked the ideas behind the work we haven't always been convinced by her style. Could this exhibition of paintings and drawings change our minds? Many of the figures she paints here come across as striking, particular where their skin tones blend into the rich colours of the backgrounds — there's something enveloping about them. With this selection of drawings and paintings it's clear to see that Yiadom-Boakye is a talented artist who can use different styles and techniques. Compared to other current figurative painters like Marlene Dumas and Tracey Emin, she is clearly a superior painter. Yet we never quite get a feeling of additional insight into the characters of the people she has painted — a quality that all great portraitists possess. Yiadom-Boakye is clearly a talented painter and this exhibition shows her work is improving. In fact, she's starting to win us over. Duane Hanson is on at the Serpentine Sackler Gallery and Lynette Yiadom-Boakye: Verses after Dusk is on at the Serpentine Gallery, Kensington Gardens. Both exhibitions are on until 13 September, are free to enter and the galleries are open Tuesday to Sunday, 10-6. While at Serpentine Sackler, keep an out for the colourful fountain made by Bertrand Lavier from dozens of hoses in the gardens. For more great art see a £1 coin made more valuable and a gallery turned into a hoarder's squat. Plus our top picks for June.